Transform the ordinary into extraordinary with custom built cabinetry that is as beautiful as it is functional. From kitchenettes to pantries, serveries, islands, built-ins, and more, our passion for design and dedication to customer service ensures a result you will love – a kitchen that will raise the value of your home and enhance your lifestyle in ways you may not have thought possible. Jim Farris Cabinets is a one-stop shop for custom kitchen cabinets in Houston. Our design team is well-versed in today’s most popular looks, including different types of wood and laminate, custom paint and stain colors, specialized designer finishes, and specialty hardware that not only looks great, but makes every moment you spend in your kitchen a pleasure. Taking inspiration from current trends and new innovations, we offer access to the newest and most exclusive looks in kitchen design. Your new kitchen cabinets will not only be one-of-a-kind, they will reflect a design aesthetic that your family will love, delivering value, versatility, and special moments for many years to come. Jim Farris Cabinets has been building custom cabinetry in Houston since the mid-1970s. Our passion for quality woodworking and customer satisfaction has long been our recipe for success. We leverage superior skills and craftsmanship to deliver an exceptional end result – one that is sure to exceed your expectations. We will work closely with you to help determine exactly what type of custom cabinetry is right for your space. Our process is many-layered, starting with the design process – during which we will go over your wish list to try and incorporate all of your kitchen wants and needs into the overall design. Our winning combination of high-quality craftsmanship and attention to detail delivers great value for your renovation dollar. We work with Houston’s most talented designers, engineers, architects, carpenters, and finishers to ensure you the best possible customer experience. Our service is unparalleled in the region, which is just one of the many reasons we have been Houston’s favorite custom kitchen cabinet builder for more than 40 years. Using scale drawings, we render your new kitchen cabinet design so that you can see exactly what the end result is going to look like before we even begin. Once the design is approved and the kitchen cabinet style is chosen, we start the planning phase. Countertops, sinks, faucets, and appliances are selected. We will provide you with a range of options for different finishes that will suit your budget. Choosing custom kitchen cabinetry gives you the opportunity to incorporate the latest appliances into your kitchen design, providing space-saving solutions that are as attractive as they are practical. If you have a challenging kitchen design to begin with, custom cabinetry will maximize your available space in ways that may really surprise you. Even if you have difficult angles, high ceilings or small spaces, our designers will develop a plan that is designed to tick all the boxes on your wish list – and meet your budget too. During the construction phase, your custom cabinets are manufactured and assembled in our Houston facility. Our computer-generated measurements are so precise that we guarantee a perfect fit the first time. This means that your kitchen reno can be completed quickly and you can get on with your busy life. Once your new cabinetry is installed, we complete the picture with your chosen finishes, countertops, backsplashes, glass or tile. In order to provide the best possible product, we partner with industry-leading specialists in plumbing and electrical to ensure your kitchen is as functional as it is a feast for the eyes. For more information or to set up a consultation for new kitchen cabinets, call our Houston showroom. 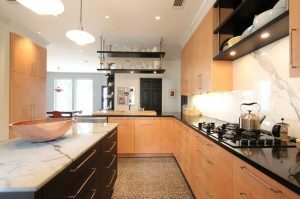 We would love to find out more about custom kitchen cabinets in Houston and talk to you about what’s possible.